Three-year campaign reduces the number of animals coming into shelters and increases adoptions throughout Maricopa County in Arizona. With donations from PetSmart Charities, the Nina Mason Pulliam Charitable Trust, and others, The Alliance for Companion Animals, which is a coalition of seven animal welfare agencies in Arizona, launched a three-year, $4.5 million campaign in April 2013 called Fix. Adopt. Save. "Maricopa County has a large pet over-population problem and had extremely high euthanasia numbers," explains alliance president Judith Gardner. "The challenge in working with seven different animal welfare groups was to develop a strategy that we could all agree upon to reduce the number of animals coming into the shelters, increase the number of fosters and adoptions, and increase spay/neuter surgeries throughout the county." Gordon C. James Public Relations was hired in November 2013 to help with the campaign. Megan Rose, account executive at the agency, says efforts May through December 2014 focused on high-risk animals, including pit bulls and cats. Last year’s campaign included multiple public events and sustained local media relations. Messaging was also driven through social media content created for campaign-specific channels and that was shared by individual alliance member organizations as well as partner organizations. The alliance participated in Maddie’s Pet Adoption Days on May 31 and June 1. The effort is run by the nonprofit Maddie’s Fund, which chose organizations in nine states to participate last year. Each organization hosts free public adoption events and Maddie’s Fund donates between $500 and $2,000 per animal adopted. Alliance members hosted coordinated adoption events on both days at more than 40 locations. The agency devised different angles for all individual alliance member organization and landed interviews with top-tier local media outlets for each. Posts about the benefits of adoption, tips for a successful adoption, and educational information for new pet owners were made regularly on the Fix. Adopt. Save. Facebook and Twitter pages. Some posts were shared on Maddie’s event social media channels, and alliance member organizations were encouraged to share posts. The team partnered with the local Univision station to host a two-hour phone bank event September 17. Alliance representatives took calls from the public about spay/neuter and adoption programs and did short segment interviews with Univision reporters. On October 18, a free Pittie Palooza event was held at the Metrocenter Mall in Phoenix to help shift negative public perceptions of pit bulls, which Gardner notes represent 24% of dogs coming into Maricopa County shelters. Attendees could adopt pit bulls on-site. Alliance members provided a variety of educational information, low-cost services (such as vaccinations and micro-chipping), and free spay/neuter vouchers. In November, which is national "Senior Pet Month," alliance organizations offered discounted adoption fees for people age 60 and older who took home pets ages 5 and older. November media pitches, select TV ads, and social media posts focused on the benefits of pet ownership for senior adults and information about adoption fee discounts. December traditional and social media efforts were dedicated to promoting cumulative results of the second year of the overall campaign. The number of animals taken into Maricopa County shelters during 2014 decreased by 19% compared to 2012, which the alliance uses as the baseline. Euthanasia for the same time period was down 47%. During the first nine months of 2014, alliance organizations performed more than 36,300 spay/neuter surgeries, up from 30,996 in the first nine months of 2013. Audience reach on the campaign’s Twitter and Facebook pages hit 33,000 and 20,000, respectively. More than 200 earned stories ran in outlets including Arizona Republic and local TV networks. The campaign will continue through April 2016. 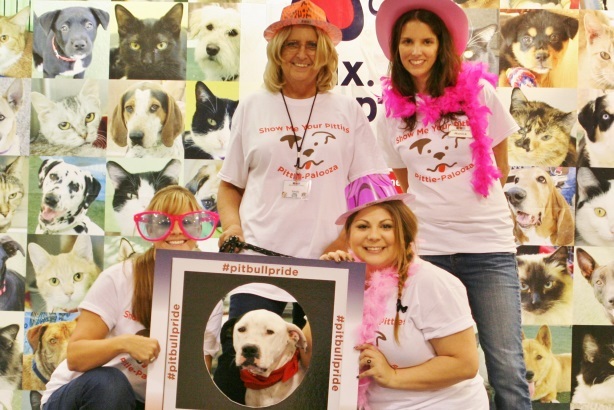 Confirmed plans for 2015 include reprising Pittie Palooza and ongoing media and social media outreach.